Very low speed demonstration with all elements downed from one wingtip to the other. 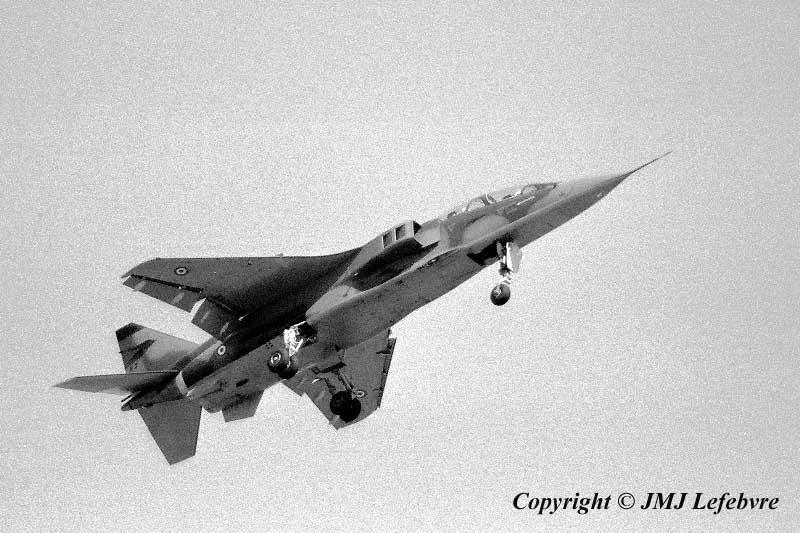 Years later I had luck to experience Jaguar at the controls and I was highly surprised to find an easy aircraft. I was able, just after a short checking by pilot, to immediately adapt to approach procedures consisting to establish, by adequate pressure on the stick, a near constant 10° at the incidence-meter and manage the whole glide slope with throttle acting as a stick for vertical trajectory corrections, this giving quite an impressive precision to land around runway sightened point. I experienced the same with Alpha-Jet and took time and pleasure to play with this kind of control while remembering that, many years earlier, finals were little nightmares with a slow Piper J-3 which loved to put its wheels a good 5OOft after the choosen landing point and was next bouncing with the greatest pleasure to show that my action on the stick was as fully improper that was my final and flare speed !! !